Shopping at Dania Furniture seemed like a good idea, at first. That was until I actually purchased a sofa and chair from them. Since then, my life has been a wreck. Read about my trials and tribulations as a former Dania Furniture shopper, and learn from my experience. I went through this horrible debacle, so hopefully you won't have to. 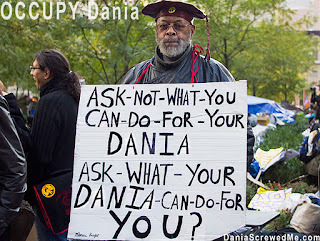 We're doing this for you, because we don't want Dania to screw you too. We will OCCUPY Dania in all of their locations by informing users of other furniture shopping alternatives in each location Dania is in. We are the 99% of Dania Furniture customers that get screwed! It is terribly unfortunate that Dania Furniture's reign of terror spans 5 states across this great nation of ours. For those of you out there in need of furniture that are in Dania infected regions, fear not, we are here to help. In an effort to provide furniture consumers with a fair and balanced perspective on where legitimate furniture stores are, we have implemented research teams in all Dania infected areas to learn how to help consumers avoid shopping there at all costs. Also, it should be noted that Dania Furniture is owned by Interline Inc., which also owns Scandinavian Designs and Plummers, which is essentially Dania with a different label. This templatized, heartless, passion-free approach to furniture design is cold and robotic, much like their customer service. In fact, it's also reflected in their web design that's reflective of their templated out furniture style and creativity...in other words, welcome to the Republic of Tacky Furniture Generica. Please stay tuned for more information about how to avoid these locations, and learn about the alternatives that await you. We vow to use this space to inform potential Dania Furniture customers to avoid purchasing all furniture (couches, chairs, desks, lamps, beds, dressers, night stands, and everything in between) with proper alternatives. If you hate Dania Furniture, are in need of furniture, in one of these locations, please contact us at daniascrewedme@gmail.com and we'll be more than happy to supply you with a list of furniture store options that are likely to leave you more satisfied than you would be shopping at Dania. In the meantime, please avoid these locations at all cost. You'll thank us for it. you listed on your site will be helpful to me. Thanks for visiting, Emanuel. We're excited to know you find our content valuable, even if you aren't a fellow Dania hater. By the way, since you're not a very sophisticated internet user, they actually have their own website http://www.daniafurniture.com, where you can browse their nauseating catalogue of gross furniture, in addition to their store locator. Thought you'd appreciate the link, considering how much of a Dania enthusiast you are. We hope your patronage at all the Dania locations all the time goes well, even though that's really weird. Hopefully your Dania furniture will match your wide array of Hard Rock Cafe t-shirts and Planet Hollywood mugs. I had purchased most of my furniture from Dania when I purchased my first condo. Immediately most of it began to break down. Everything purchased at Dania has been replaced by other furniture within the first 3 years as it was all garbage. Save yourself some money and find a different furniture store. Poor, poor manufacturing. Man oh man, so sorry to hear about your awful experience. Thank you for taking the time to contribute valuable content to our wonderful visitors. Hopefully the trials and tribulations you experienced will be strong warning for customers who are willing to engage in risky business with Dania. Not sure if you're talking about furniture you purchased from Dania or if it was from another company, but that's a great story nonetheless. © Dania ScrewedMe LLC, 2011, 2012, 2013. Simple theme. Theme images by Ollustrator. Powered by Blogger.